Asclepias, commonly known as Milkweed Plants or Milkweeds, is an American genus of herbaceous perennial, dicotyledonous plants that contains over 140 known species. With their fragrant flowers, which grow in clusters like little bells, all Milkweed Plants are a magnet for butterflies. Some Milkweed species are short and will work best at the front of the border, others are taller and make a statement among other plants. Milkweed Plant is an upright specimen that may reach 2 to 6 feet (0.6 to 1.8 m). Leaves grow from a thick stalk and are large and green, taking on a reddish color as the plant matures. In youth, leaves are waxy, pointed and dark green, later dropping from the stem and allowing the milky substance to exude from the growing milkweed. Stems become hollow and hairy as the plant matures. 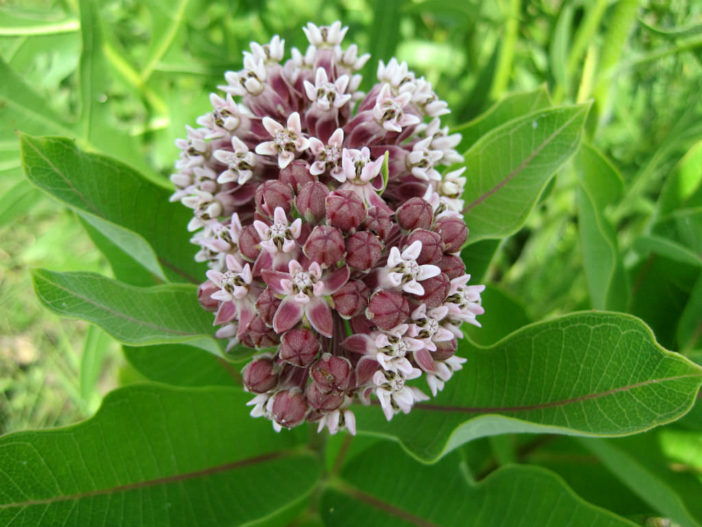 The Milkweed flower is pink to purple to orange and blooms from June to August. Common Milkweed (Asclepias syriaca) and its cousin Butterfly Weed (Asclepias tuberosa) are an integral part of the butterfly garden, a source of nectar for butterflies and hummingbirds. Growing milkweed supplies larvae of the Monarch with food and shelter, providing caterpillars food and a resting place before they leave the caterpillar stage and become butterflies. As the plants can be toxic, consumption of the plant protects caterpillars from predators. Milkweed plants benefit from vernalization, a process of cold treatment, before sprouting. They get this when planted outside, but to speed up the growing process, treat the seeds through stratification. Place seeds into a container of moist soil, cover with a plastic bag and refrigerate for at least three weeks. Plant into containers, if desired, and place under a grow light inside about 6 weeks before soil temperatures outside have warmed. Keep the soil moist by misting, but seeds can rot if allowed to sit in soggy soil. When plants have 2 sets of leaves, transplant the seedlings to their permanent, sunny location outside. Space plants about 2 feet (60 cm) apart, if planting in a row. Milkweed Plant grows from a long taproot and does not like to be moved after planting outdoors. Mulch can help conserve water. Grow Milkweeds in mixed borders, meadows and natural areas. Grow Milkweed plants with tubular-shaped, shorter flowers in front of them to offer more pollen to our flying friends.